Tewitfields is an ideal venue for anglers of all abilities and offers something for everyone. Available to fish either on a day ticket, 24 hour permit or longer, the lake is home to some real specimens. 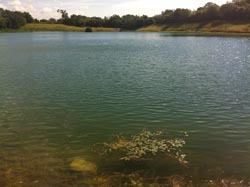 Carp to 30lb, bream to 10lb plus, roach and rudd to over 2lb and perch topping 5lb have all been caught at Tewitfields. Day tickets are available in the hut at the side of the lake, or on the bank if there's no-one in the hut. Camping & caravans are accommodated and you can pitch up a tent more or less right next to the water. There is a log cabin that is available for rent too, ring for details.